Who's The Best in the Cowl? 1. Adam West - Like Johnny Weismuller as Tarzan, Clayton Moore as The Lone Ranger and George Reeves as Superman, Adam West IS Batman! 2. Micheal Keaton - "Batman" and "Batman Returns". Good combination of campy Batman and Dark Knight. 3. George Clooney - A better Batman stuck in a not-as-good Batman movie. 4. Val Kilmer - A lessor Batman, lucky to be in a better movie. 5. 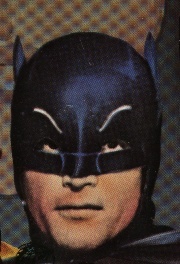 Robert Lowery - "Serial Batman". What can you say? The technology just wasn't there in 1949. The opinions expressed in these rankings are final. While other opinions are appreicated, they will not change the rankings.